A main goal of health economics is to encourage efficient use of health services; essential to this objective is a thorough understanding of the implications of migration health care. In this book, we examine what factors decide health and health care; first we evaluate which is the perceived need of health care among immigrants, second we analyze the demand and supply side; moreover we formalise health data information system with an application and case study. The search strategy was to use these several appropriate keywords: immigrants, migration, health care, health services, perceived barriers, need, epidemiology, pathologies, hospitalization, illegal immigration, ethnicity. The initial screening of the identified articles was based on their abstracts. The selection of the relevant articles was based on the information obtained from those abstracts, and was agreed upon in consensus meetings among the authors. Full-text articles that were retained for closer inspection were again evaluated independently. 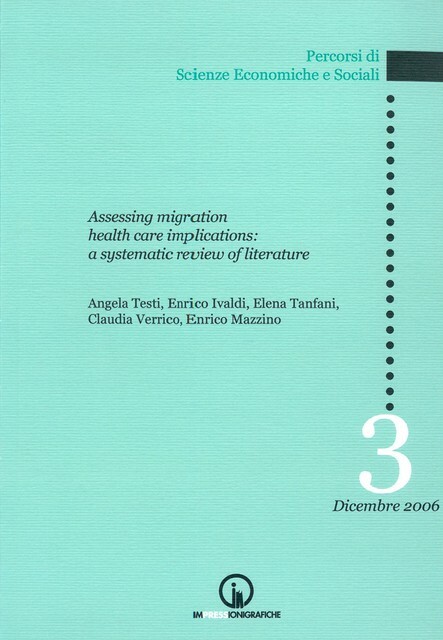 This approach enabled us to identify 850 articles dealing with migration health care implications; 525 full text articles were obtained for closer inspection. Of these, 114 articles were included in this final review.